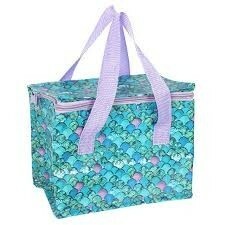 Stunning deep sea green, pink and lilac mermaid scale design lunch bag. Fully insulated it is perfect to keep food cool or warm. Zip closure with cotton handles. Wipeable pvc.